Microscopic polymer cubes that can alter their shape and move when actuated by a magnetic field have been developed by US researchers. The cubes, which can be assembled in a range of ways, are metallic on one side, allowing them to use magnetic energy from their environment to carry out a range of tasks, such as capturing and transporting single cells. The team from North Carolina State University and Duke University who produced the microbot origami have been studying the fundamentals behind the directed assembly of anisotropic particles (such as Janus particles). They showed here an approach to assembling and pre-programming these minute structures from microscopic cubes as a way of altering their shape, in research that could lead to microbots and micro-origami assemblies that operate as cell characterization tools and fluid micromixers, as well as components of devices such as artificial muscles and soft biomimetic devices. Figure 3. Single yeast cell capture, transportation and release by a microbot prototype. The study, reported in Science Advances [Han et al. Sci. Adv. (2017) DOI: 10.1126/sciadv.1701108], was based on active particles that take energy from their environment and convert it into directional movement. As the cubes are magnetized and interacting, they store energy, with tiny particles in the shape of cubes combining in sequences where they face in different directions. 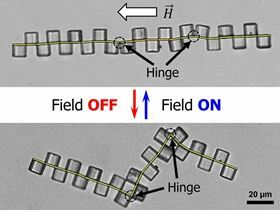 Described as behaving similarly to a microscopic Pac-Man, they can be opened by applying a magnetic field and then closed again by turning the field off as they release the stored magnetic energy. The design mimics the way proteins work, where the sequence of amino acids determine how it folds. 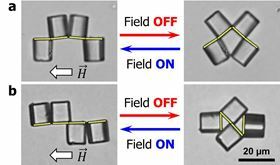 However, in these structures their self-folding and re-shaping patterns in magnetic fields can be programmed by the sequence in which the small microcubes are organized; they can also store magnetic energy from the field in the assemblies, which is then used to re-configure reversibly on demand. The team tested the microbot by capturing a yeast cell, where it formed into a cuboid shape using its opening and closing motions to surround the cell. As co-corresponding author Orlin Velev said, “We've shown here a prototype of a self-folding microbot that can be used as a microtool to probe the response of specific types of cells, like cancer cells”. Such an ability to remotely control the dynamic reconfiguration of the microbots could offer an innovative platform for single-cell isolation and targeted drug synthesis/delivery/therapy, and the same principles could be extended to more advanced structures by using more complex particle shapes, compositions and field parameters. The team are now exploring how to make the particles move on their own instead of steering them with magnetic fields. Allenby and colleagues developed a tissue-engineered 3D hollow-fibre perfusion bioreactor system.